Wellingtonians flocked in thousands to try out the new cable car service between Lambton Quay and Kelburn when it opened for business in February 1902. The Kelburn & Karori Tramway Company Ltd had been formed in 1898 by shareholders in the Upland Estate Company, which wanted to develop the hills above Wellington’s central business district for housing. Convenient transport was a vital part of the plan. 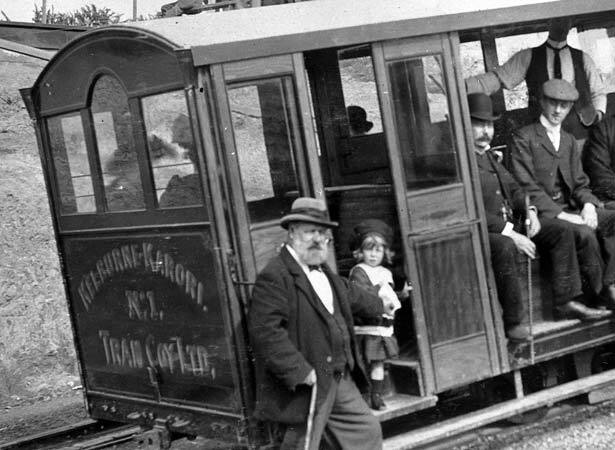 A cable car service and horse-drawn carriages would connect the new suburb with both the city and the outlying borough of Karori. James Fulton’s design was a milestone in New Zealand engineering. The line was 785 m long and climbed 119 m, an average gradient of 1 in 6.6. It passed through three tunnels and over three short viaducts. The journey from Lambton Quay to the top of the hill at the north end of Upland Road took just 3½ minutes. A steam engine powered the cable winding gear from a two-storey powerhouse at the upper terminus. This drove an endless wire rope that operated alternately up one line of track and down the other. The car driver signalled by bell to an engineer in the winding room to apply the gripper lever for the descending cable car. This lever gripped the cable so that as this car descended, a second cable – the tail, or balance rope – hauled the ascending car upwards. When the cars reached the top and bottom respectively, the rope stopped moving. The tramway took 2½ years to complete. As well as paid labourers, men from the Terrace Gaol also worked on its construction. The cable car was a significant and enduring engineering achievement. It fulfilled its intended role by helping to open up the Kelburn area for housing (those who purchased the first sections in 1902 were rewarded with free passes), and has since become one of Wellington’s iconic tourist attractions.